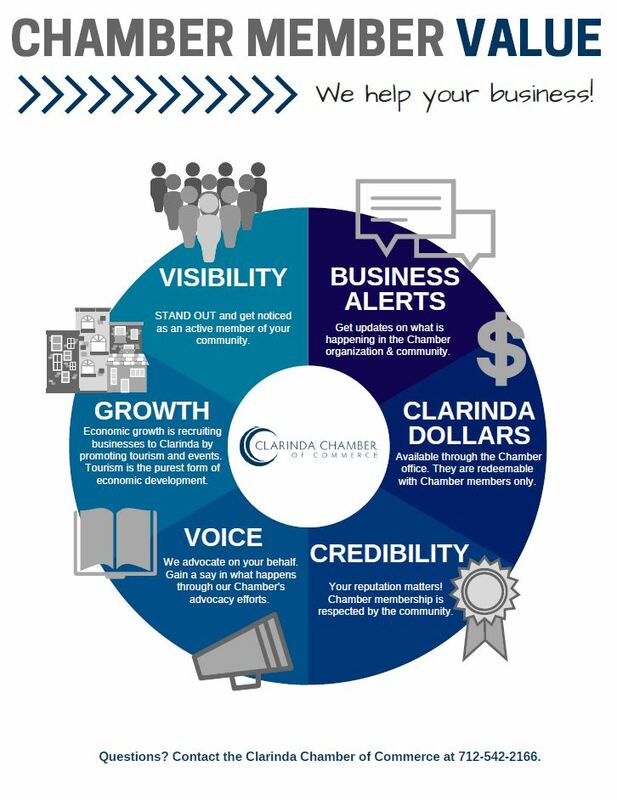 The Clarinda Chamber of Commerce is a volunteer-led, member-supported, non-profit corporation working to strengthen the overall community and economic vitality of the Clarinda area. The Base Membership Rate for 2019 is $260.00. This includes two full-time employees and additional employees will be calculated into the annual membership fee. There are four business categories. Please select the category which best applies to your business. Base rate of $260.00 plus total number of full-time and part-time employees. Base rate of $260.00 (covers one licensed professional) plus $100.00 for each additional licensed professional, and $23.00 for each licensed employee. Base rate of $260.00 plus $77.00 per (1) million dollars in deposits or fraction thereof. Base rate of $260.00 plus 87¢ per unit serviced (Hook-up). We encourage community members who are not owners or official representatives of a business to become supporters in our efforts at a reduced rate. Associate memberships are $50.00 per year. The goal of the Community & Retail Promotions committee is to promote Clarinda businesses through community events, retail promotions and marketing opportunities. There is an additional fee of $100.00 per year. To join the Clarinda Chamber of Commerce, please click on the links below, fill them out and send them back with your dues to : 115 East Main Street, Clarinda, IA 51632.